These bible coloring pages will remind you of those activity books for kids we all enjoyed as children. Magnificent Christian coloring books accompanied by many drawings of Jesus, Noah's ark and Adam and Eve coloring pages will be a great past time coloring in, but you and your children might also learn some things about the Creation itself through coloring games for kids. For a kid who wants to know more about the story of Jesus and 12 apostles, coloring bible drawings is going to be a lot of fun. Bible Coloring Book with lots of Christian drawings is waiting for you: come and get it! Choose between many biblical drawings to color with different characters and motives: Noah's ark, Adam and Eve, crucifixion, the birth of baby Jesus, Moses and many others. Try and tell your children these beautiful stories about these characters while coloring bible drawings and playing coloring games for kids. They will be thrilled knowing that these Creation coloring pages have a background story, one they will hear many times after that. Coloring sheets have always been a great way to entertain your kids, and with Bible Coloring Book, you can make no mistake. It doesn't really matter if you are a Christian or not: these biblical drawings to color will be a nice activity for kids of any age. Coloring games for kids have many advantages, and the little ones won't turn down the opportunity to color Noah's ark coloring pages with so many different animals. 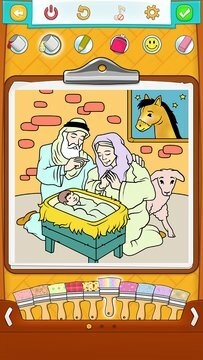 Let your children learn about the life of Jesus Christ: give them this breathtaking Bible Coloring Book and let them express their imagination through these amazing Christian drawings. Coloring sheets for kids as an educational tool is an excellent method to improve motor skills, fine motor movement, hand to eye coordination, handwriting and color perception and recognition. Psychologists suggest that coloring pages for kids have a therapeutic effect as coloring is a centering activity that can train focusing and calm the mind. Even though coloring pages can contain simple pictures, it can be a challenging task for kids. The ability to complete a picture successfully builds a better self - esteem and confidence among children. Many kids like to color and coloring games seem to be more than just a fun free time activity. Coloring books should be used every day as a part of educational material in every school as it is proven to be influential to personality development starting from early childhood. 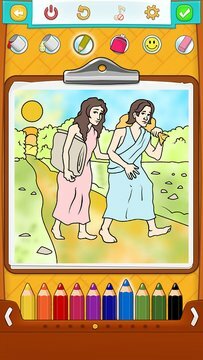 All the drawings and images in Bible Coloring Book app are copyright of Peaksel. For any questions and/or suggestions, please contact us.